Glenavon manager Gary Hamilton. Pic by Pacemaker. Glenavon stand one game away from greatness - having gone from nothing to play for in the eyes of many to nothing to lose. Goals by Rhys Marshall and Josh Daniels last Wednesday handed the Lurgan Blues a first-leg Europa League advantage of 2-1 over full-time Molde before Thursday’s test in Norway. 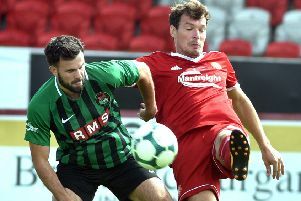 Progress would rank as one of the great results within Irish League clubs’ European history and boss Gary Hamilton is daring to dream alongside the reality of the challenge that remains for his part-time players. “We still face Molde with no-one expecting us to do anything but over my time as Glenavon manager the players have produced time and time again when in need of a surprise,” he said. “If we managed to go into the next round that would stand as one of the great achievements by an Irish League side, given the quality of Molde. “One poll we saw ranked Molde as the 100th best club side in Europe at present, which is remarkable and just another cause to celebrate the brilliant performance last week in Lurgan. Glenavon’s squad arrived in Norway on Wednesday on a chartered flight before a return journey planned following the game. Jonny Tuffey, Rhys Marshall, Andrew Mitchell, James Singleton and Sammy Clingan will each miss the second leg. “The whole experience will provide our players with so many memories no matter what happens but we also have something to play for in Norway,” said Hamilton this week. “The aim is to arrive Wednesday to do a light session on Molde’s 4G pitch. “If we managed to pull off a miracle it will go down in history. “There is a lead to protect but we know it is going to take massive good fortune and that slice of luck.